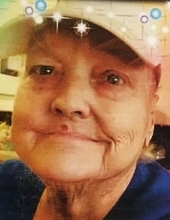 Polly Ann McElroy, 74, of Pana passed away on Tuesday, November 27, 2018 in Decatur Memorial Hospital. She was born August 28, 1944 in Missouri to the late Calvin & Esther Jordan. Polly was a homemaker and enjoyed bingo, jewelry, music & tv. She married Harvey David McElroy on June 5, 1959 in Missouri. He preceded her in death in 2002. Polly is survived by her daughters: Mary Baham, Pana, IL; Betty Thacker, Louisiana; Mazie (Turtle) McElroy, Pana, IL; grandchildren: Misty Byrd & Charlie Jones, Indiana; Robin & Joey Sloan, Pana, IL: Frog & Amanda Moore, Taylorville, IL; Larry & Peggy Moore, Louisiana; James Thacker, Louisiana; William Moore, Jr., Louisiana; many loved great grandbabies; sisters: Pat Walker, Louisiana & Charlotte Smith, South Carolina; and brother, Calvin Jordan, Jr., Louisiana. She was also preceded in death by a son, Harold McElroy, Jr.; sisters: Judy Pruitt & Brenda Butts. Cremation rites will be accorded and no services are planned. "Email Address" would like to share the life celebration of Polly Ann McElroy. Click on the "link" to go to share a favorite memory or leave a condolence message for the family.